ENTER TO WIN $100. We’re launching a new auction site! So until the end of July 30, 2018, all new bidders on our store ChicagoNWS will be entered to win a $100 Visa gift card. Bidding on this one lot is FREE and will enter you to WIN $100. 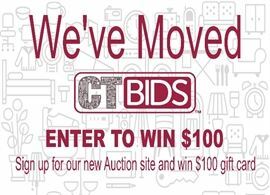 Visit chicagonws.ctbids.com and look for the “Enter to Win $100” lot, sign up and place a bid on the lot. Remember: Bidding on only this lot is free: you owe us nothing! But if selected, you could win $100! *You will also be entered to win if you bid on one of our auction items, too, but it’s not necessary to win.